The yellow lab, which must have its leg amputated, is introduced to students in Leeds on Monday. LEEDS — Kids at Leeds Central School on Monday met a sweet-faced, 9-week-old yellow Lab born without a wrist bone. He is due to have his front leg amputated and a hernia fixed later this month. And after the puppy recovers, Christy Gardner hopes to bring him back once a week as part of training to become a school therapy dog. Principal Danielle Harris hopes after that, he stays. She sees lessons her 200 students can learn about kindness and embracing difference. “It’s going to hopefully teach them this puppy’s gone through so much, and yet here he is – he’s going to be happy, he’s going to be loving, he’s going to live life to the fullest and not let his three legs get in his way,” she said. A 9-week-old yellow Lab puppy that is being trained to become a service dog, foreground, waits for a treat with Moxie, a fully trained service dog owned by Christy Gardner, right, on Monday at Leeds Central School in Leeds. CBS News filmed the yet-unnamed pup’s school debut Monday for an upcoming “On the Road” segment with Steve Hartman. 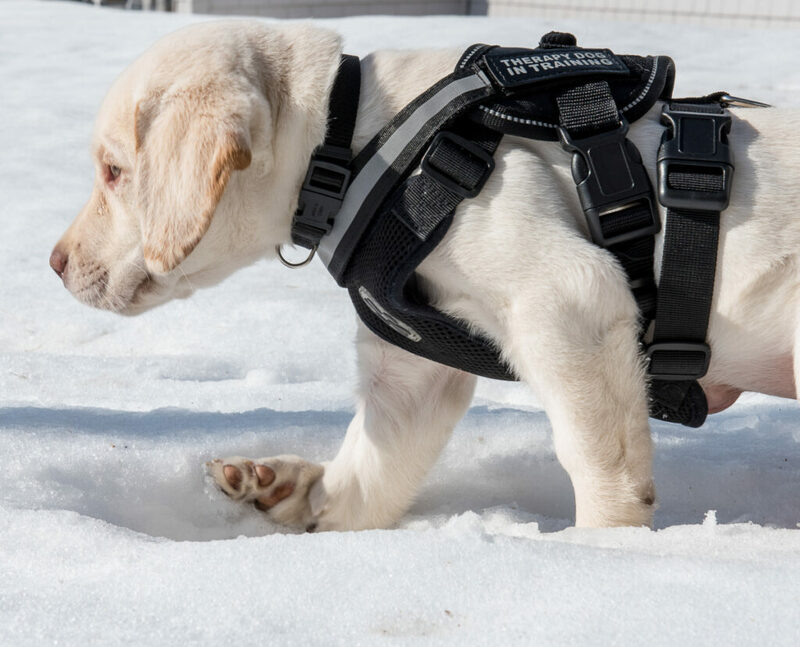 VetriScience Laboratories in Vermont also surprised Gardner with news the company will donate $10,000 for the pup’s surgery and future expenses. Kids will vote on a name for him this week. The effort started last December when Gardner, an Auburn veteran and double amputee, brought her service dog, Moxie, in for a presentation. Students in Jennifer McLure-Groover’s third- and fourth-grade classes had seen pictures of the late President George H.W. Bush’s service dog, Sully, lying beside his casket. They had questions about what service dogs do. Students got inspired to raise $1,000 to cover the expenses of getting a service dog for a veteran through the Maine nonprofit K9s on The Front Line, and are still working at that, having raised $766 so far, Harris said. During Gardner’s visit, Harris, who has been principal for nine years, remembers sharing with McLure-Groover and Gardner that it was her dream to have a therapy dog for the school. A young service dog-in-training who will soon be named by Leeds Central School students plays in the snow before Monday afternoon’s assembly. Gardner, who works at Varney’s Labs in Turner, said the pup had been born to a litter there and, despite the disability, owners could see his potential. “They gave him a fighting chance when they didn’t have to, and now (have) enabled him to do something amazing,” she said. Gardner said two dogs she has raised in the past year have become therapy dogs at schools in Missouri. She gets reports about students cuddling them and opening up about their feelings, or the dogs serving as icebreakers. 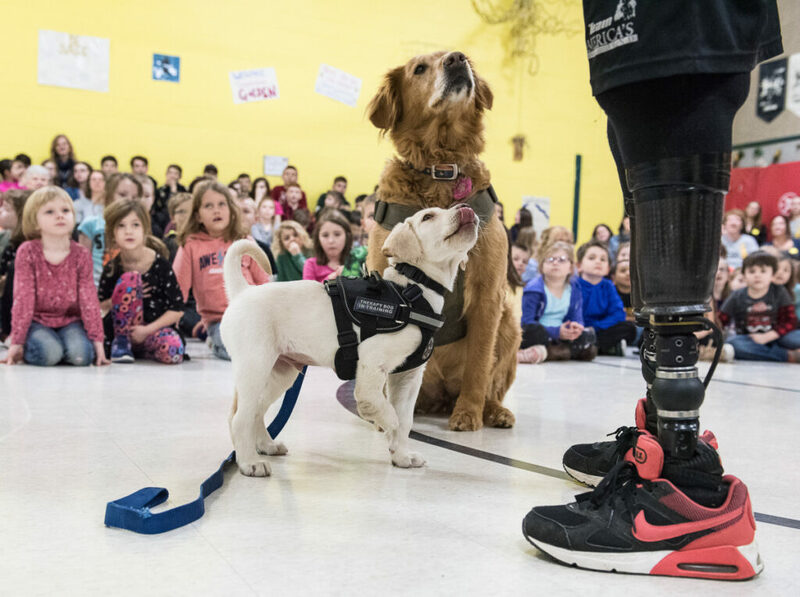 “Having my own service dog and knowing what the dogs are capable of, and how big of an impact that Louie and Darcy Jo have made in their (Missouri) schools, it could be huge for (Leeds),” Gardner said. She is anticipating a two- to three-week recovery after surgery, and about a year of training. “He’ll have to pass his canine good citizen and his public access test, which does take a lot of discipline and manners,” Gardner said. Before Monday, Gardner had already set up a GoFundMe page to cover surgery and expenses, like canine health insurance. She also posted a video of the puppy playing online that shows him ambling along and walking on the side of his curved right front leg. His full leg has to be removed both for his safety and mobility, she said. His skin is also starting to break down from wear, she said. Varney’s is donating the puppy to the therapy effort. Harris said the decision on whether the dog can stay with the school rests with the superintendent and school board. Chairwoman Betsy Bullard said Monday the pup was not yet on the agenda for the full board to discuss. If training goes well and the puppy gets permission to stay, Harris said she anticipates the pup having a weekly schedule, during which he will spend time in different rooms, with the school counselor or hanging out in the office – and then head home with Harris at night. Harris said she is researching other Maine school districts that have therapy dogs. She has found two so far. Lindsey Sawyer-Brown, president of the Leeds Parent-Teacher Committee, said she could not be more excited about the idea. “My hope for the students would be to enhance overall learning and physical wellness, help learn social skills, ease social isolation, help young readers gain confidence, (to name) a few,” she said. Harris said students were excited Monday to hear about the training and being part of the experience. The puppy visited classrooms after the assembly, and there were plenty of chances for petting and questions.